What can I send to Luxembourg? What items are restricted? Whether you are planning a city break, an activity holiday, or are in Luxembourg City for business at one of the many corporate headquarters in the city, Send My Bag can help make your journey a pleasant one. You can have your luggage picked up from your doorstep or office and have it delivered to your hotel, ready and waiting for your arrival. You can also avoid the possibility of excess or oversized baggage fees by sending your sporting equipment, including hiking gear and bikes. Avoid queuing at bag drop or luggage carousels and hop on and off public transport without having to drag your bags behind you. If you are a student studying for your degree in Luxembourg, or perhaps spending your year abroad there, Send My Bag can send all the possessions you will need for your stay in Luxembourg. Shipping your things allows you to have many more of your favourite possessions with you than you could check into the hold of your plane. Whether you need extra holiday luggage or you need to ship all of your possessions to Luxembourg, Send My Bag can help by shipping your luggage and boxes for you. This takes care of all the heavy lifting and allows you to get on with enjoying your journey. You can pack all the possessions you need to make you feel at home in Luxembourg. To learn more about sending luggage to Luxembourg, visit our ‘How it works’ page, or our ‘FAQs’. Although a small country, Luxembourg has six golf clubs to choose from, including Kikuoka and Grand Ducal de Luxembourg. Why not send your golf clubs to Luxembourg with Send My Bag and sample these courses using your own familiar equipment. The added benefit is that you don’t have to wait around at bag drop or luggage carousels, or have to drag large golf bags behind you. See more information on how to send golf clubs with Send My Bag, including how to best package your golf clubs. Cyclists are well catered for in Luxembourg. There are 600 km of cycle paths available, plus 500 km of mountain bike trails. Why not explore Luxembourg by bike by sending your bike to Luxembourg with Send my Bag? Given its small size, you could even cycle the full length of the country. You can send your bike to your first accommodation and have it picked up at your final accommodation. Your bike needs to be taken apart and safely packaged up before being sent to Luxembourg. Check out our information on bike shipping to learn more. If you are moving house to Luxembourg you will have to consider international removals to Luxembourg. Make sure you choose a reputable removal company that you have researched well and that you package up all your items carefully so that they arrive intact. Use suitable packaging for your items and tape everything up well. If you are studying in Luxembourg this year, at the University of Luxembourg, or if you are taking a third year abroad there, Send My Bag can help you ship everything you need to Luxembourg, from books, to clothes, to writing materials. Send My Bag can send your possessions to your student accommodation, making your move an easy one. Discover more about student shipping on our student page and find out how to receive your student discount. You can send a parcel to Luxembourg with Send My Bag, which is a handy option if you need to send a smaller number of items – if you left some items at home when you moved to Luxembourg, for example. Friends and family can also use the service to send you gifts or care packages. When sending a parcel to Luxembourg make sure you select a sturdy box and seal it up properly so everything remains intact during transit. Read more about sending a parcel and find out what you can send with Send My Bag and how to package your items. If you have something like a console table or an ottoman to ship to Luxembourg, air freight might be the option for you. Transit time is usually one to two days, making this a quick service. The cost can be quite high, though, especially if you have a large shipment. In addition, you will need to hire a customs agent to clear your shipment through customs. Another cost to think about is getting your items to and from the airport, which means the price of using air freight could quickly mount up. If you send internationally by air freight to Luxembourg your items will likely arrive at Luxembourg-Findel Airport. Sea freight or container shipping is another option for shipping large bulky items to Luxembourg. Sea freight shipping can take a number of weeks but this option can be cheaper than air freight. You will still need to pay for the services of a customs agent, however, and will need to sort out how to get your items to and from the ports. When using container shipping to Luxembourg, your items will most likely arrive in a neighbouring country that borders the sea, such as Belgium, France or Germany. Based on 38958 independent reviews. I am overall happy with the service. There was a mishap with the courier which seems to have been caused by a failure to submit all the address details I gave while booking. As it was later solved and the delivery went well, I am overall satisfied. Probably next time I will contact support sooner if I experience any delays. The customer service was very helpful and professional. The majority of countries offer consignees a duty-free allowance for personal effects, which means that most Send My Bag shipments pass through customs without being stopped. Personal effects are typically viewed as used items that have been in the sender's possession for 6 months or more. To indicate to customs officials that your shipment is made up of personal effects, you must create a short non-generic packing list online, to be completed as follows: "1 x Woollen Coat, 4 x Pairs of Canvas Shoes, 5 x Cotton T-Shirt", and so on, rather than as "10 x Used Clothing". If Luxembourg customs discover brand new or commercial items in your shipment you may be required to pay customs duties and taxes. You should keep this in mind if you are sending Christmas gifts to Luxembourg. Please check with local customs so you are aware of any customs duties that need to be paid, follow any advice provided and attach all documentation required of you. As customs processes and allowances are different depending on the country, we ask travellers to take 5 minutes to see how their particular circumstances and what they are sending will be viewed according to current Luxembourg customs regulations. Further information is available on our customs information page. Luxembourg makes a great holiday destination, whether you are looking for beautiful landscapes to explore during a week-long activity break, or architecture to admire during a couple of days in the city. The capital of the country, Luxembourg City contains plenty of sites, shops and restaurants to keep you busy for a few days, from the elegant Grand Ducal Palace, to the old quarters of the city and its fortifications, and the Musée d’Art Moderne, itself an architecturally impressive building. Shopping in Luxembourg City comes with the added bonus for visitors residing outside the EC of VAT being deducted from prices in many shops. 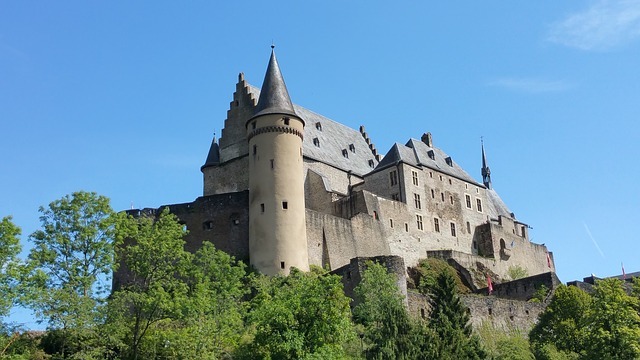 If you are planning to venture beyond the capital city, there are plenty of impressive landscapes to walk or cycle in, such as the Mullerthal region, the Moselle, the Ardennes and the areas around the rivers Sûre and Our. The Mullerthal region contains three different walking trails and there are cycle paths following the three rivers, Moselle, Sûre and Our.